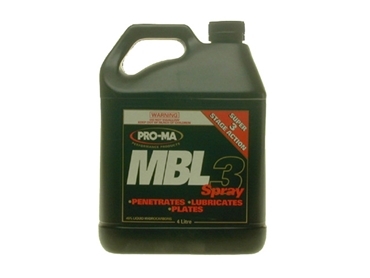 MBL3 Spray from PRO-MA Fuel and Oil Additives is a multistage penetrating lubricating spray. The powerful action of this dynamic solvent penetrates, lubricates and plates rigid areas and offers a residual lubrication for easier reassembly of components. MBL3 lubricating Spray has the same micro-metallic particle features as MBL 8 and MBL Grease. But, in addition, it contains a penetrating solvent and has a lighter consistency. MBL3 lubricating Spray has three functions. Firstly, it penetrates. Upon spraying the area to be treated, the penetrating solvent starts to work its way into the components. As the solvent penetrates it carries with it the microscopic, metallic particles. It also lubricates. As the solvent continues to penetrate and then evaporate, it leaves the lubricating micro-metallic particles. Thirdly, it plates. As the lubricating surfaces are worked, the micro-metallic particles plate the scratches and score marks, filling in the worn areas, providing long lasting lubrication of the surface as well as leaving residual lubrication.